Bullock Creek Middle School was recently visited by the ABC12 Spirit Squad and the Lancer Pride has never been more alive! With faces painted and voices strong, students filled the gym in a sea of black and gold. For the first time ever, all three bands lead the enthusiastic crowd in pep songs and cheers. All of this excitement was for a fantastic cause. Lead by the BCMS Student Council, the annual holiday food drive kicked off on October 22. 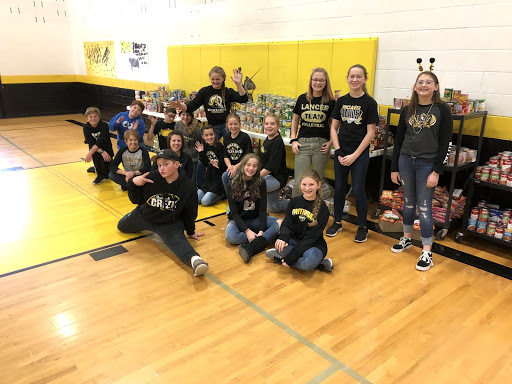 Each year there is a friendly competition between classes to see who can bring in the most food, but when ABC12 asked BCMS to be part of the quest for their coveted Spirit Cup, the competition kicked into high gear! By the time of the ABC12 visit the students had collected enough non-perishable food items and monetary donations ($1 = 9 pounds of food) to equal 4200 pounds!!! A portion of this provides holiday meals to families in our district, and the remaining donations will stay within the community and will be distributed throughout the year. The Spirit Cup Challenge runs until May and BCMS is currently one of the top three schools in the competition! We are so proud of our students and the generosity they showed for this amazing cause. We look forward to seeing the pounds of food continue to grow throughout the year. If you would like to help the middle school reach the ultimate goal of over 10,000 pounds, please contact Amy Brege or Emily Eickhoff, student council co-advisors, for more information. BCMS Student Council proudly shows off the mountain off food collected during the food drive.